Apple has announced that it has found specific flaws in iOS 5 that can be patched to address the battery life issues some iPhone users have experienced with the new software, noting that an update is planned to address the problem in the next few weeks.  iOS 5.0.1 beta introduces a new way for developers to specify files that should remain on device, even in low storage situations." Since the release of iOS 5 and the new iPhone 4S, specific users have complained about serious battery life issues, although the problems appear to be tied to different settings, carriers, and usage patterns, making the core problems difficult to diagnose and address. Apple had reportedly been actively investigating the issues with specific users to determine what fixes could be rolled out to general audiences to broadly resolve the problems. Some users have discovered specific settings that seemed to be actively consuming battery life, including the automatic date and time setting, iTunes Ping, per-app notification settings, and even the "raise to speak" feature in Siri. Apple's latest iPhone 4S uses a much faster A5 processor with twice the graphics cores and a higher clock speed, but the company notes that average talk time, WiFi browsing and audio and video playback should be roughly the same as the previous A4-based iPhone 4, thanks to new technologies including a slightly larger battery. 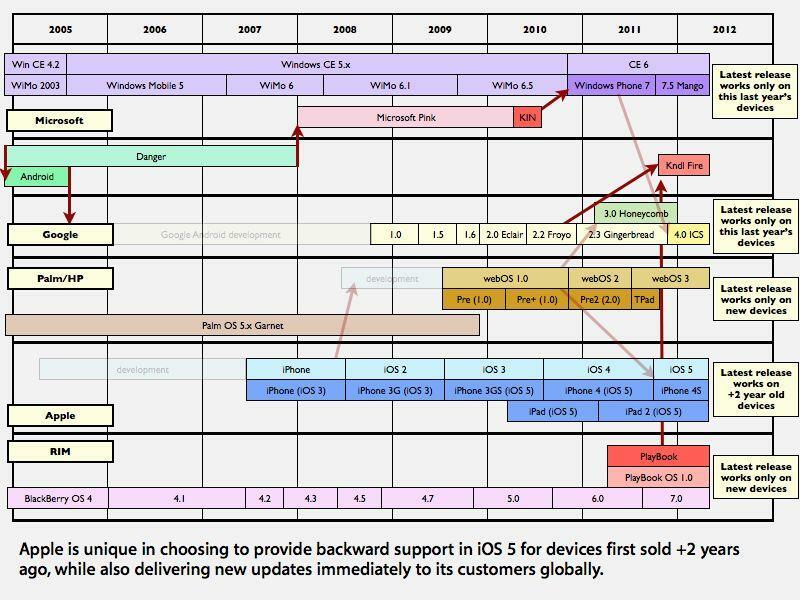 Apple has historically released between six to ten free updates for iOS between annual major updates, rolling them out to users rapidly as soon as they are available, making it unique among competing mobile platforms.